The CD is a collection of original music and arrangements that criss-cross many American genres, including, jazz, R&B, neo-soul, Nu-Jazz, Latin, classical and gospel. During the Jim Crow Era, the practice of the Colored Waiting Room was a custom that segregated black passengers from the general population as they waited to board various modes of public transportation. They represented in the public sphere a space of containment and even the presumption of contamination. Yet on the flip side, it was also a place where one was free to be one's self, where one could express things beyond the scrutiny of a broader, suspicious, though voraciously consuming public. This CD takes place in a nightclub called "The Colored Waiting Room." The music here, like any identity in the original Colored Waiting Rooms, is not restricted and refuses to pin itself down to a specific genre. Each song’s message of life, love, desire, and joy are the result of providing talented individuals from different backgrounds and musical dispositions material through which they could dream, interpret, and execute. 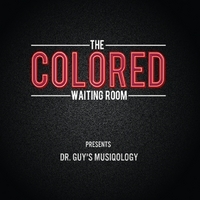 Step into the experience of the Colored Waiting Room. Enjoy and imagine together with us. A Moment in Time - the Definitive Musical Journey! The bittersweet echoes from the "Colored Waiting Room" evoke a sense of fulfillment and joy, as I allow my mind and soul to experience this virtual musical journey of sorts! The nightclub atmosphere totally engages me, as a listener. Dr. Guy and the band turns up the "funk" machine with the intro track, setting the pace for a delightful evening! "Match Play" showcases the genius of Dr. Guy's MusiQology, stacked with smooth grooves and vibrant melodies! "Stolen Moments" features the sultry, sassy vocals of the one and only Denise King - full of passion and soul! "Little London's Lullaby" and "Sketches of Your Smile" both feature Bridget Ramsey's charming vocals. "Lake Como" remix bridges the smooth transition from the "Y the Q?" CD, so wonderfully executed! Chris Syms "preaches" a powerful message to the people in his passionate delivery of "Did I Mention" - good stuff! Robert Ramsey gets it poppin' with those tight beats as we relax during the intermission, while Dr. Guy and Denise King grace the atmosphere with some lively "feel good" music! June Townes' graceful soprano vocals is featured in this historical musical piece - "Someone is Listening," backed by Greg Payne's elegant piano. Kathy Lou Schultz brings it all together with the expressive "poetry in motion" featured "In the Colored Waiting Room." "Curva Peligrosa" is a smooth groove full of Latin "flava," lightly infused with a shot of tequila for the more adventurous listener! Austin Woodlin prepares us for the more spiritual side, as he gets us in the churchy mood on the B3, followed by a wonderful arrangement of the popular communion hymn, "Break Bread." Millie Gonzalez puts the in "sweet", while Rod McGaha, Rick Tate, and the band provides the finest music for such a sacred ceremony! Finally, ain't no stoppin' with "The Big Cat Grooving" - it's all about the horns!!! Tony Smith and the band pulls out all the stops on this one! Dr. Guy's MusiQology gets five stars in this wonderful collaboration of talent - they certainly perfected the art of "Groove-ology!" Tukufu Zuberi's voice-overs made the evening an awesome celebration, and I'm sure to revisit the "Colored Waiting Room" again, and again, and again...!!! Phenomenal!! !